Buzz Blog: 2011 Chemistry Nobel for . . . Quasicrystal Physics! In normal crystals, atoms lie on three-dimensional lattices of cells. Each cell has an identical pattern of cells surrounding it. In a quasicrystal, the local arrangements of atoms are fixed, but each cell has a different configuration of cells nearby. Although the structures are strikingly similar to the quasiperiodic tilings invented by mathematician Roger Penrose (which Martin Gardner popularized in a 1977 Mathematical Games column in Scientific American), there was little in the crystallographic field to presage the experimental breakthrough. Shechtman himself did not immediately recognize the quasiperiodic structure in his sample, and was at first mystified by the diffraction pattern. "I knew the diffraction pattern was not from twins [which result from a common crystal defect]," recalls Shechtman from his office at Technion University in Israel, "but I did not come up with an explanation for what it was." 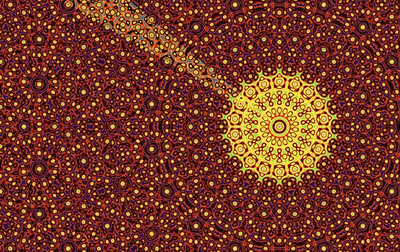 Quasicrystals would eventually inspire a tidal wave of activity in crystallography, mathematics, physics, chemistry, and material science. Initially, however, Shechtman's discovery was viewed with skepticism. "For two years I did not have anybody who believed my results and was usually ridiculed," says Shechtman. "The scandal of polywater was still in the air, and I feared for my scientific and academic career." Fortunately, one of his colleagues at Technion University was willing to take Shechtman's data at face value. "In 1984," says Shechtman, "Ilan Blech proposed the model, later known as the Icosahedral Glass model." Together, the researchers wrote up an article that contained the model and the experimental results, and sent it off to the Journal of Applied Physics in the summer of 1984. "JAP rejected it on the grounds that it would not reach the proper readers and suggested I send it to a metallurgical journal." Shechtman and Blech took the AJP editors' suggestion. The article was accepted by Metallurgical Transactions, but remained unpublished for nearly a year. Eventually, Shechtman brought the article to the attention of John Cahn, his longtime host at National Bureau of Standards (now the National Institute of Standards and Technology) and an eminent materials scientist. Cahn recommended streamlining the paper; leaving out details of the model and experiment, and limiting it solely the experimental findings. After consulting with Denis Gratias, a mathematical crystallographer at the Centre National de la Recherche Scientifique in France, the group submitted an abbreviated article to Physical Review Letters in October 1984, more than two years after Shechtman's initial experiment. The article was published several weeks later. This time the response to the paper was almost immediate, says Shechtman. "Scientists from around the world called me days after the PRL publication to say, 'We did it and we see what you saw.' " Discussion of Shechtman's paper dominated an international conference on mathematical crystallography held a few months after the letter's publication, and by 1986 the first international meetings dedicated to quasicrystals were under way. "The discovery brought a fresh breeze to young scientists looking for a challenge," says Shechtman, "and quasicrystal science is a challenge, big time." The fact that so many researchers could duplicate Shechtman's work so rapidly presents something of a puzzle. How could quasi-crystals have evaded the community of crystallographers for so long? "That is a question I have tried to answer many times," he replies. In addition to the vital input he received from his collaborators, says Shechtman, his discovery required several critical components. First, it was necessary to make esoteric, rather than useful, rapidly-cooled alloys. Then a researcher would have to study them with a transmission electron microscope ("And be damn good at it", he adds), perform numerous detailed analyses, and finally "Face the world of nonbelievers, face ridicule, and defend your idea? Shechtman concedes that it's likely others may have previously seen quasicrystals without realizing it. "Seeing it was just one step in the long process that led to the article in PRL." Blech left Technion to pursue microelectronics production in Silicon Valley shortly after helping Shechtman identify his quasicrystal sample. Cohn is now an emeritus researcher with the National Institute of Standards and Technology, and was a 1998 recipient of the National Medal of Science for his contributions to materials science, solid-state physics, chemistry and mathematics. And Gratias is currently director of the Laboratoire d'Etudes des Microstructures in France. Shechtman is still at Technion and, except for a five year interlude dedicated to chemical vapor deposition of diamond, has spent nearly all his career studying quasicrystals. The discovery that he once thought might be an embarrassment tantamount to the polywater scandal has had a dramatic effect on his life. "It exposed me to several sciences, made me known to very many, and put me in the focus of meetings and discussions," says Shechtman. "In the four years that followed the PRL paper, I gave one hundred lectures worldwide." He has received numerous prizes and awards for his quasicrystal research, and is nominated for many more. Oddly enough, Shechtman has one complaint about the field that he originated: use of the word quasicrystal. "I do not like the term, since it implies that quasi-periodic crystals are not crystals, and according to the new International Union of Crystallographers definition, they are. But the term is widely used. I prefer to call them quasi-periodic materials. The term quasicrystal, in fact, does not appear in the article ranked eighth on our list of the ten most-cited Physical Review Letters.